This game is insanely great; and difficult... But rewarding ! Here is the Crawl Wiki for everything related to the game with some Strategy guides and walkthroughs. I don't generally test out games but I was amazed how many platforms this was out for (Win/Mac/Android/Linux), it's open source (GPLv2), and seems to be getting active development. Unfortunately I wasn't able to get things running. I found the github site to be a better homepage just because it gives a little more detail. 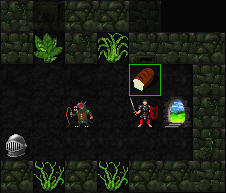 Dungeon Crawl Stone Soup is a game of dungeon exploration, combat and magic, involving characters of diverse skills, worshipping deities of great power and caprice. To win, you'll need to be a master of tactics and strategy, and prevail against overwhelming odds.